Hewlett-Packard has been one of the first large manufacturer to adopt the Motorola 68000 microprocessor since 1981. The HP9816 was the fourth 68000 based computer of the brand. It was also called the Series 200 Model 16. Hewlett-Packards Series 200 included the HP-9816, HP-9826, HP-9836, and HP-9836C. The Model 16 was intended to be a "lion package in a house cat". When the keyboard was "parked" in the optional special housing placed under the unit, the computer footprints was 1 quare foot exactly. To ensure such a small size, Joe DeWeese, HP's project manager designed a very compact CPU board with a chip density never seen before. Model 16 could be used as a standalone workstation and connected to a large variety of mass storage devices, as well as numerous HP peripherals including printers, plotters and a graphic tablet through the HP-IB port. It also could act as an intelligent terminal or be connected to HP's Shared Ressource Management (SRM) network. SRM permitted up to 68 Series 200 computers in any conbination (including the HP-9835, 9845 and HP-9000 computers). The computers were connected via twisted-pair cables to a 9828 which controlled the network. System could run HPL, Pro-BASIC or Pascal. 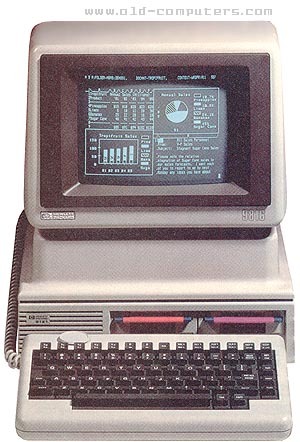 68000 version of the CP/M operating system (CP/M 68K) was also available. Any or all languages and operating systemms could be stored and loaded from the same drive and/or plug-in ROM cards on the same computer. User could select the one that he wanted the computer to load at power-up. see more Hewlett Packard HP-9816 Ebay auctions !